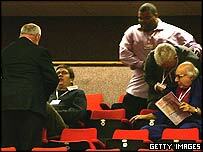 Party chairman Ian McCartney criticised Mr Wolfgang's behaviour but said the way he was ejected was "inappropriate". "I'm going to personally apologise to him," Mr McCartney said. "I'm going to personally meet him if he takes the opportunity." Mr Wolfgang, who escaped Nazi Germany in 1937, is a member of the Stop the War Coalition. Erith and Thamesmead constituency party chairman Steve Forrest, who was sitting next to Mr Wolfgang, was also thrown out after complaining about his treatment. However Mr McCartney said Mr Wolfgang would not be allowed back into the conference, which ends on Thursday. The Labour Party has a responsibility to remove people who create a "persistent disturbance", he said. The party said it would be examining the events leading up to the ejection. Labour MP Linda Riordan branded the treatment "very heavy-handed". The Halifax MP's attempt to have Iraq debated at the conference was earlier blocked. Mr Wolfgang shouted out as Mr Straw told delegates: "We are in Iraq for one reason only to help the elected Iraqi government build a secure, democratic and stable nation." Mr Straw had also compared Iraq to Germany after the World War II, where it had taken four years before elections were held. The party member of 57 years' standing told the BBC Two's Daily Conference Live programme: "These two toughies came round and wanted to manhandle me out. "I said: 'Do you want me to leave? I will leave, you don't need to manhandle me.' Physically, I am not too well, so I said I would follow them. "Most of the Labour Party stewards are very nice people. One or two people lend themselves to this nonsense. "It makes me feel that the people who resort to these tactics are very unsure of themselves and they are on the losing side." Outlining the measures taken by its officers, Sussex Police said: "The protocol in this situation is that a police officer is called. "The police officer attended and asked the man to wait for a member of the Labour Party. "We wish to stress that the delegate was not arrested or searched at any point during his brief interaction with the police officer and that it is a matter for the Labour Party to decide who they allow into their conference."